I have recently started working with a new client in Leatherhead and, very conveniently for me, they live within walking distance of my house. 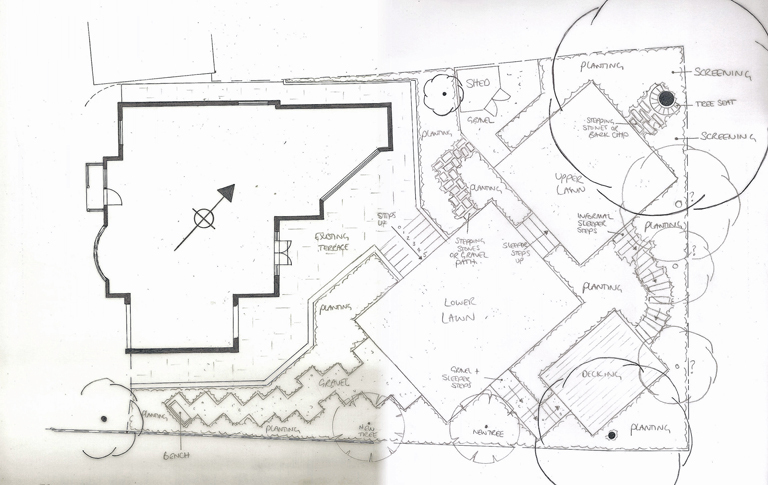 This project has quite complex levels and it will be necessary to terrace the garden in order to make it more usable. My clients have recently had an extension built on the back of the house and, as part of this project, the terrace was installed by the builder and so was the retaining wall. Unfortunately, the retaining wall is starting to fail which is due either to the absence of drainage or because the footings are not appropriate to the soil, which is heavy clay. Such a shame that they will have to spend more money on this element of the garden, but so important to ensure that the problems are rectified – hopefully the existing wall can be saved. 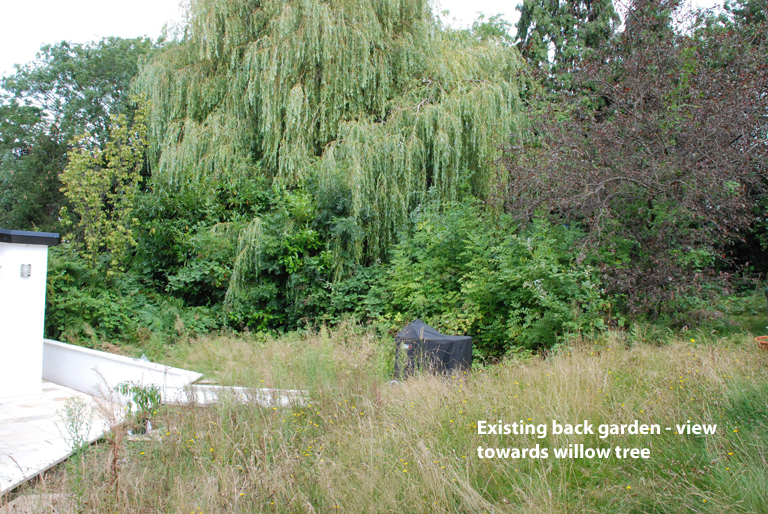 The garden now is really overgrown and this makes it feel small and enclosed, but there is an amazing willow tree which we really want to make a feature of the garden. When you stand underneath it and look up, it’s quite a spectacular site. The existing steps are too narrow and you might be able to see that the dimension of the risers is different for each step. 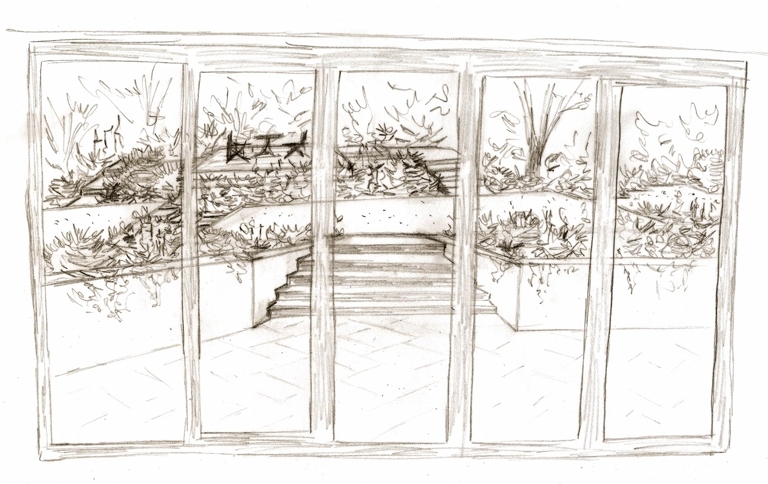 As they will need to be rebuilt anyway, I am proposing that we widen these steps so that they feel more in balance with the bi-fold doors and open up the view from inside the house. Adding an extra step will make it more comfortable to get to the lower lawn. 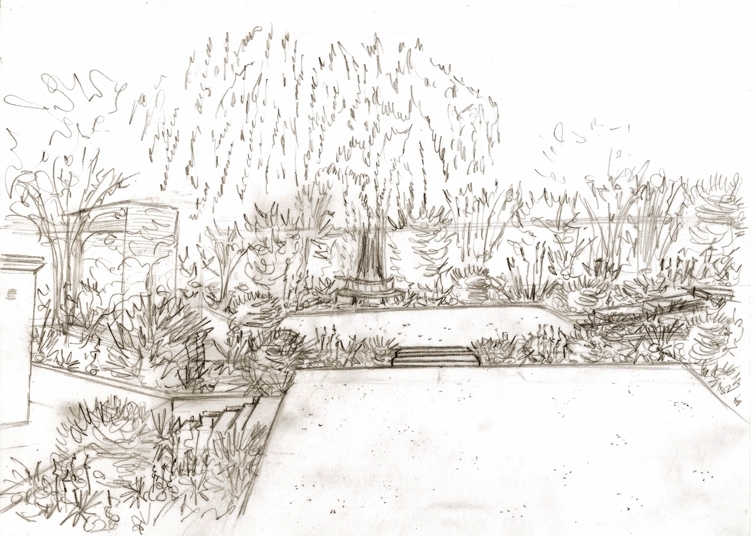 The slope of the garden will be terraced to create three separate parts of the garden, a lower lawn, upper lawn and decked seating area which has been located to catch the evening sun. 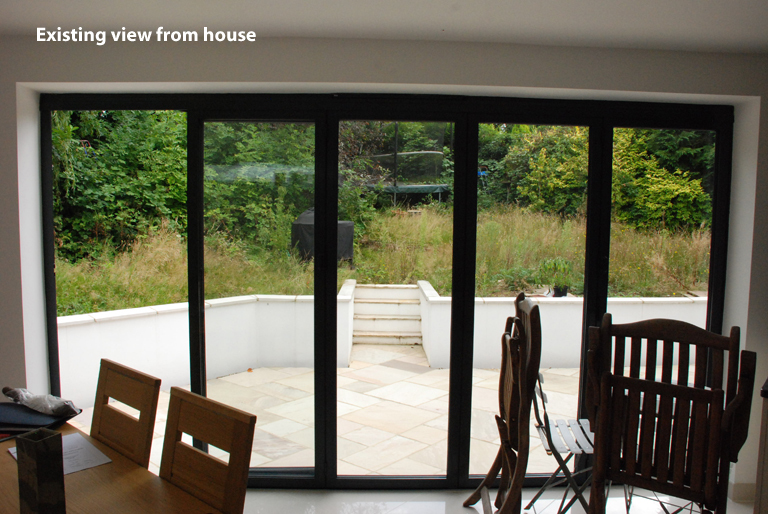 The main terrace by the house isn’t quite large enough for a table and chairs but as the dining room is just inside the bi-fold doors, we have chosen to go with lounge seating for this space. A couple of the existing trees will be taken down, the conifers on the boundary and also the prunus in the middle of the garden. 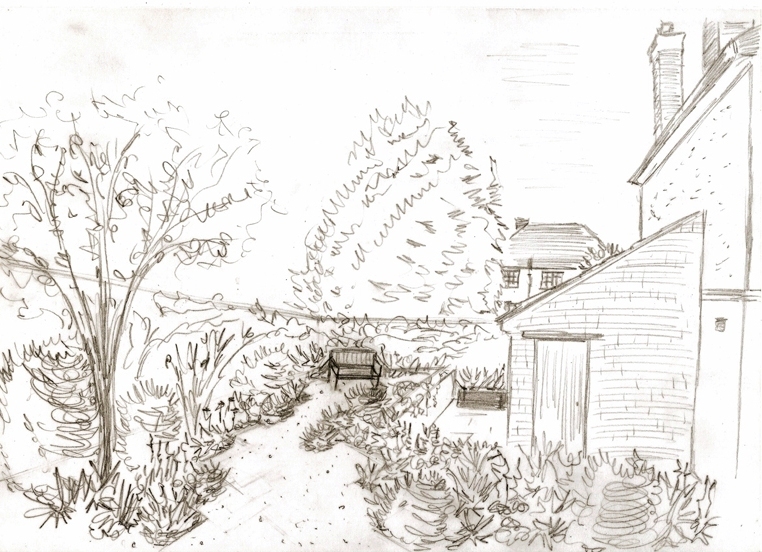 My clients are really keen to open up the space so that they can see more sky and because the main part of the garden is so much higher than the level of the terrace by the house, it will be important to keep the planting here lower. We will replant a few trees along the boundary. 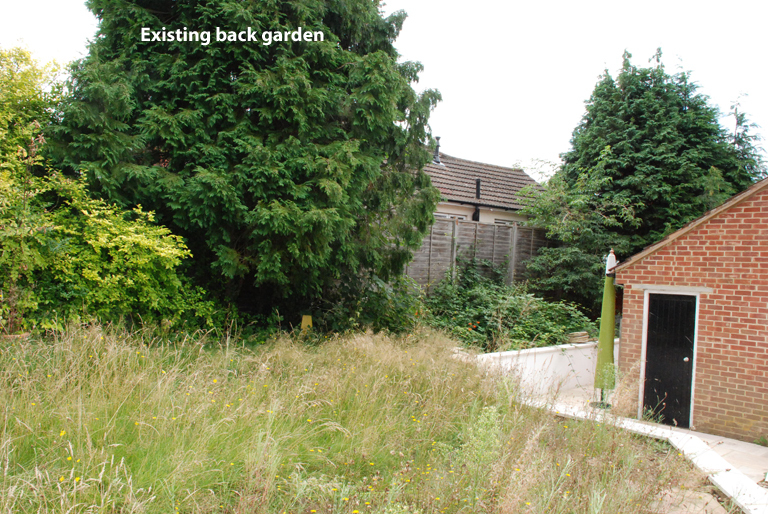 The main focus at this point is to sort out the retaining wall, but I am really looking forward to seeing the garden once it’s been cleared and you can really get a better sense of the space. I’ll be sure to share the progress with you as I move the design to the next stage.